For all grant programs, the Salem Health and Wellness Foundation only accepts applications via its online application system. This automation includes all stages of the application process: initial letters of inquiry, full applications, grant agreements and follow-up grant reports. We no longer process paper copies of these documents. All deadlines are firm. Letter of Inquiry (LOIs) and proposals submitted after their respective deadlines will not be accepted. All organizations interested in applying should consult our Eligibility Requirements to ensure they meet the Foundation’s guidelines prior to submitting a LOI. Each year the Foundation is able to fund only a fraction of the requests that are reviewed. A denial of funding is not necessarily a reflection of the program or proposal, but is the result of a highly competitive process. Currently, we are not accepting unsolicited applications. Proposals will be accepted by invitation only. If your organization has been a past applicant or grantee, you should have login credentials already established in our online grant database. PLEASE (pretty please) don’t create a new organizational profile to re-apply. If you do not know your organization’s username and password, please contact us; we are happy to help. The foundation has several different funding programs. You are encouraged to review all material before applying to the foundation. If you have any questions, please call the foundation at (856) 299-4460. 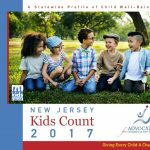 The Kids Count Report compares New Jersey’s 21 counties on 13 measures of child well-being, including child poverty, health, safety and education. The report can be used by nonprofits, local, county and state leaders, in their efforts to improve the well-being of all New Jersey children.